Eve Neill is a young, well-situated woman, living in a sweet, urban area of La Bandelette. A villa quarter of 1930’s France, with no reason at all to worry about life. Wouldn’t it be for the worries caused by her former husband Ned Atwood, who seems to be disturbing the peace and quiet she had built with her new family, the Lawes, and her fiancé Toby. When a grisly murder is committed, policemen come flocking to the world of the wealthy and their suspect is none other than the angelic Madame Neill herself. Everything seems to point against her, yet she is certain of her innocence because of a circumstance she can’t reveal. Will she be dragged to prison while the true culprit roams free? What really happened that fateful night, when she was visited by an unwanted guest? Can she trust anyone of those around her? Those questions will be unveiled when the startling truth behind a gruesome murder and a little trinket comes to light. 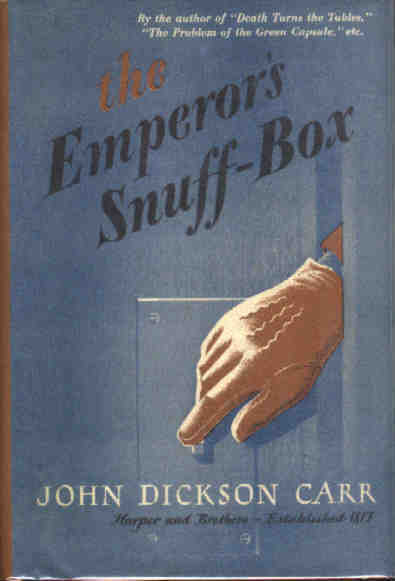 This was my second novel by John Dickson Carr, the first being “The Hollow Man“, and again I was very well entertained by Carr’s style. What I found especially interesting is, how the setting, the characters and the atmosphere where so fundamentally different from that first novel read. When Hollow Man was something of a Gothic Mystery, this one resembled a Film Noir. The beautiful lady in peril, the two suspicious men, the compromising situation forcing her to keep silent. Next I’m going to read “The Burning Court” and I already wonder how that’s going to be like. What bothered me a little bit and already bothered me in Hollow Man is how Carr’s mysteries seem a bit forced. While the characters, the atmosphere and the setting is great, the real solution falls a little bit flat because it relies on so many coincidences. These are not outright bad, but you keep wondering if what was given throughout the story could actually be considered hints. But I have to admit, I liked how the basic solution was actually so apparent from the first few pages on, but became more and more blurred because of the narrative trickery of perspective. I fell into the very same trap as the characters in the book only noticing it a few pages before the solution was given. That was a bit less unfair than the admittedly very far off solution to Hollow Man, though maybe a bit less grand as well. The plot was very well constructed. It always kept pushing forward and I couldn’t put the book down. It had almost no flaws in atmosphere or tension, even though there were quiet scenes here and there. This might be part of what I described in the beginning, this novel being more like a Film Noir or a Thriller. The main character is in constant peril and almost on the run from the law. It’s quite different from the more classical approach, where we follow a detective and never really care about who becomes a suspect. And it’s also interesting how Carr seems to have had more of an influence on movies and the references crossed to the most different kinds of genre, while his colleagues are often confined to the same subgenre. I don’t see Carr being mentioned that often by authors of detective fiction (aside from the locked room study) while Queen, Christie, Chandler and even one-timers like Poe or Leroux seem to be mentioned again and again. ~ by seizonsha on 2011/04/06.